Given the drought tolerance of the host trees, it seems fitting that their symbionts are also stress resistant: Ensifer arboris was described as tolerant to temperatures up to 41-43 °C, 3% NaCl, several heavy metals (including Pb, Cd, Hg, Cu) and a wide range of antibiotics [3,5], characteristics that contribute to the success of the rhizobial-legume tree association in challenging environmental conditions . Here we present a summary classification and a set of features for E. arboris strain LMG 14919T (Table 1), together with the description of the complete genome sequence and its annotation. E. arboris LMG 14919T is a motile, non-sporulating, non-encapsulated, Gram-negative rod in the order Rhizobiales of the class Alphaproteobacteria. The rod-shaped form varies in size with dimensions of approximately 0.25 μm in width and 1.0-1.5 μm in length (Figure 1, Left and Center). The strain is fast-growing, forming colonies within 3-4 days when grown on half strength Lupin Agar (½LA) , tryptone-yeast extract agar (TY)  or a modified yeast-mannitol agar (YMA)  at 28°C. Colonies on ½LA are white-opaque, slightly domed and moderately mucoid with smooth margins (Figure 1 Right). 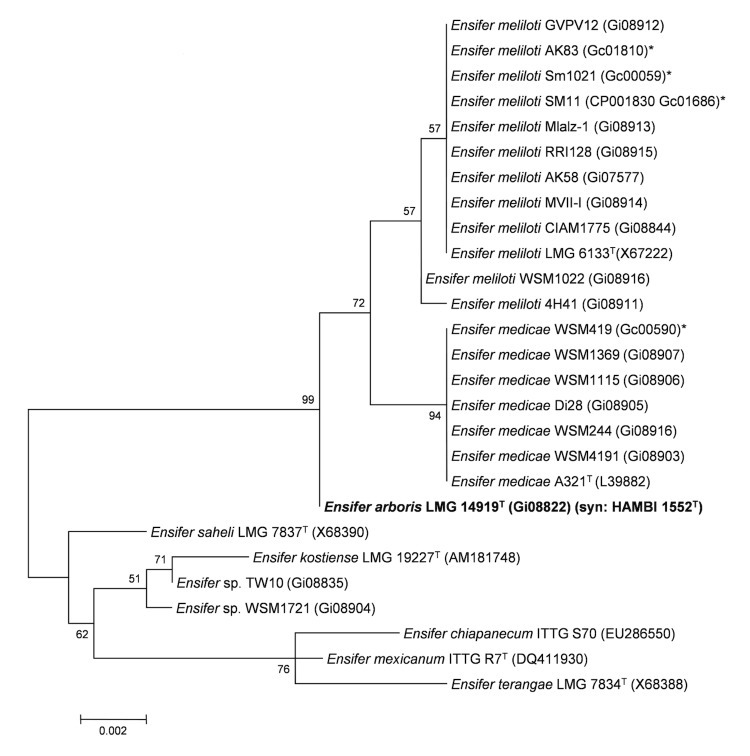 Genome sequencing project information for E. arboris LMG 14919T. The genome of Ensifer arboris LMG 14919T was sequenced at the Joint Genome Institute (JGI) using Illumina technology . An Illumina short-insert paired-end library with an average insert size of 270 bp generated 19,256,666 reads and an Illumina long-insert paired-end library with an average insert size of 9,232.94 +/- 2,530.88 bp generated 1,365,298 reads totaling 3,093.3 Mbp of Illumina data. All general aspects of library construction and sequencing performed at the JGI can be found at the JGI user home. The initial draft assembly contained 27 contigs in 9 scaffolds. The initial draft data was assembled with Allpaths, version r38445, and the consensus was computationally shredded into 10 Kbp overlapping fake reads (shreds). The Illumina draft data was also assembled with Velvet, version 1.1.05 , and the consensus sequences were computationally shredded into 1.5 Kbp overlapping fake reads (shreds). The Illumina draft data was assembled again with Velvet using the shreds from the first Velvet assembly to guide the next assembly. The consensus from the second VELVET assembly was shredded into 1.5 Kbp overlapping fake reads. The fake reads from the Allpaths assembly and both Velvet assemblies and a subset of the Illumina CLIP paired-end reads were assembled using parallel phrap, version SPS 4.24 (High Performance Software, LLC). Possible mis-assemblies were corrected with manual editing in Consed [32-34]. 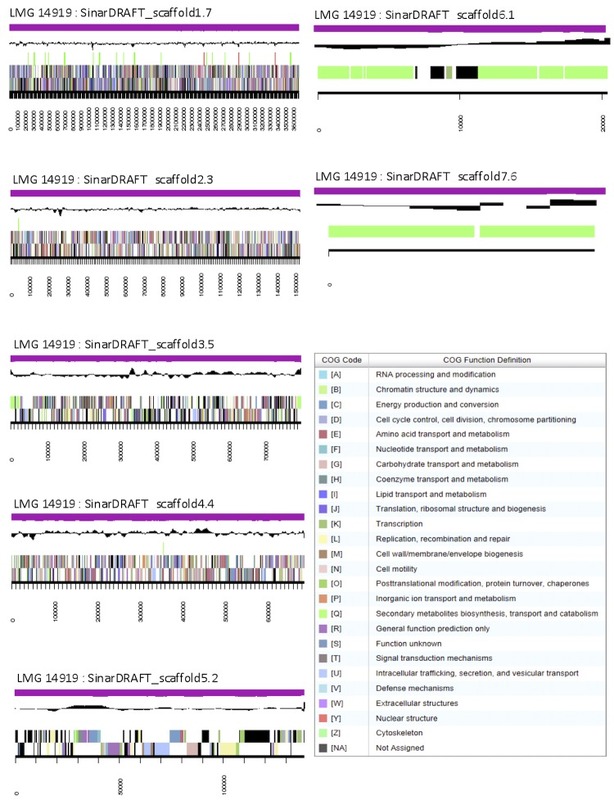 Gap closure was accomplished using repeat resolution software (Wei Gu, unpublished), and sequencing of bridging PCR fragments using Sanger (unpublished, Cliff Han) technology. For the improved high quality draft, one round of manual/wet lab finishing was completed. A total of 46 additional sequencing reactions, were completed to close gaps and to raise the quality of the final sequence. The estimated total size of the genome is 6.9 Mbp and the final assembly is based on 3,093.3 Mbp of Illumina draft data, which provides an average of 448× coverage of the genome.